Mistra EviEM | SR5 Have the phase-outs of PFASs affected concentrations in the environment? SR5 Have the phase-outs of PFASs affected concentrations in the environment? PFASs can now be found in the environment across the globe. 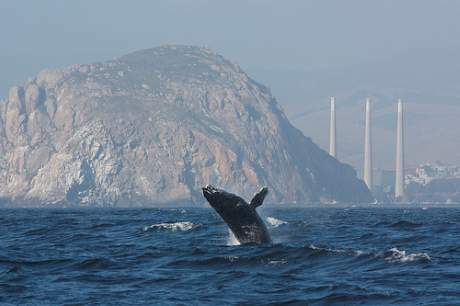 Picture shows a humpback whale off the coast of California. Photo: Devra Cooper. Poly- and perfluorinated alkylated substances (PFASs) have been released into the environment across large areas of the world. Several PFASs are toxic and slow to degrade. In 2000, therefore, the industrial sector began to phase out some of these compounds, and further voluntary and regulatory actions have followed. EviEM has now conducted a systematic review of how these actions have affected concentrations of perfluoroalkyl acids (PFAAs) in the environment. Poly- and perfluorinated alkylated substances (PFASs) are used in many commercial products, such as in water-, dirt- and stain-repellent clothes and carpets, fire-fighting foams, paints and adhesives. They are also used in industrial processes, for example as surfactants and emulsifiers. PFASs do not occur naturally, but as a consequence of having been in use for over 60 years, they are now present in the environment. Here, they can be transported over long distances by ocean currents or in the atmosphere. Many PFASs are very persistent (slow-degrading), and some of them are also readily taken up and accumulated by living organisms, possibly with negative health effects. According to a report published by the Swedish Environmental Protection Agency in 2012, PFAS levels in the aquatic environment are so high that they pose a risk of liver damage and reproductive disorders in seals and otters. Birds, too, could suffer reproductive disturbances when exposed to PFASs. In some Swedish peregrine falcon eggs, one PFAS compound has been found at concentrations which other studies show can cause adverse effects, and average concentrations in eggs of the species are close to this harmful level. Living organisms mainly take up PFASs with long carbon chains (containing at least 6 or 8 carbon atoms). The most common of these, perfluorooctane sulphonic acid (PFOS) and perfluorooctanoic acid (PFOA), are now being phased out in some parts of the world, but elsewhere their manufacture and use continue. Each molecule of PFOS, which is one of the most common PFAS substances, consists of 8 carbon atoms, 17 fluorine atoms, 3 oxygen atoms, a sulphur atom, and a hydrogen atom. Drawing: Claes Bernes. The phase-outs of PFASs are sometimes followed by the introduction of alternative industrial processes and products that could become new sources of PFASs. This may decrease the environmental benefit of the phase-outs. It is therefore important to study not only the phased-out PFASs but also the occurrence of other PFASs and PFAS precursors. The systematic review included human samples as well as biological and abiotic environmental samples. However, we did not include humans with occupational exposure to PFASs or populations exposed to point sources such as contaminated drinking water since we aimed at investigating effects of voluntary phase-outs and legislative regulations rather than effects of local conditions. We included 12 PFAAs and one precursor in the review. The included PFAAs were perfluoroalkyl carboxylic acids (PFCAs) and perfluoroalkane sulfonic acids (PFSAs). Most of the studies were conducted in North America and Europe followed by the Arctic. A small number of additional studies have been conducted in East Asia. Owing to the diversity of PFASs (i.e. chain-length, molecular weight, degree and pattern of fluorination, presence of polar functional groups etc. ), it is difficult to generalize their production histories, properties, and environmental fate. Different temporal trends between different PFASs are therefore expected, but the results show that the trends can vary also for individual PFASs, even within the same region or sample type. The results also show that many published datasets have low statistical power to detect any trend even if there would be one. Such datasets provide little information on changes in concentration with time. Nevertheless, some fairly clear patterns can be discerned. In regions where regulations and phase-outs have been implemented, human concentrations of Perfluorooctane sulfonic acid (PFOS), Perfluorodecane sulfonic acid (PFDS), and Perfluorooctanoic acid (PFOA) are generally declining, while previously increasing concentrations of Perfluorohexane sulfonic acid (PFHxS) have begun to level off. Rapid declines for some PFOS-precursors have also been consistently observed in human studies. In contrast, limited data indicate that concentrations of PFOS and PFOA in humans are increasing in China where the production of these substances has increased. Human concentrations of longer-chained PFCAs (9-14 carbon atoms) are generally increasing or show insignificant trends with low power to detect a trend. For environmental samples there are no clear patterns of declining trends. Most substances show mixed results, but a majority of the trends are based on datasets with low power to detect a trend and appear to be insignificant. The evidence base for environmental samples is thus relatively weak. However, in environmental biological samples, increasing trends predominate for concentrations of PFCAs with 9-14 carbon atoms. 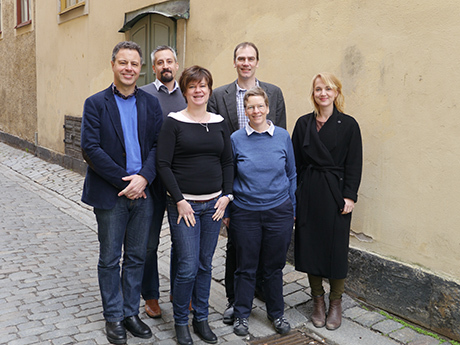 First meeting of the review team, April 2014, from left: Ian Cousins, Jonathan Martin, Dorte Herzke, Magnus Land, Cynthia de Wit, Jana Johansson. Photo: Sif Johansson.